Halim Perdanakusuma Reservoir's retaining wall repair, which is done along 390 meters in Makasar, East Jakarta, is now completed.
" Halim Perdanakusuma's retaining wall repair is now completed"
East Jakarta SDA Sub-dept. 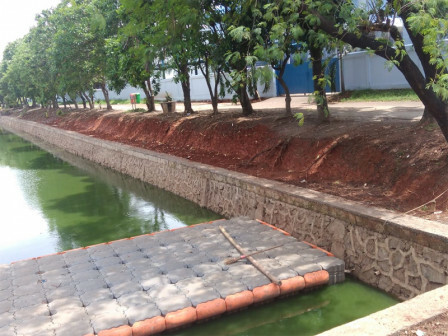 's Maintenance Section Head, Yoserizal stated, Halim Perdanakusuma Reservoir's retaining wall repair was done last August and completed last week. This retaining wall is repaired because lots of its parts are collapsed and cracked. "Halim Perdanakusuma's retaining wall repair is now completed. It remains the rest of the former excavated land," he said, Monday (12/17). He explained, collapsed and cracked parts are most likely caused by its old construction. Damaged retaining wall is as long as 390 meters. "We repair it using river stones to make its foundation stronger and not easily damaged. While its base and top are installed with sloof or concrete," he mentioned.